Familias Unidas por la Justicia started to make news back in 2013 when they organized six strikes at the Sakuma Brothers Berry Farm in Washington, though the struggle of workers there was already at least a decade long. Farmworkers in the United States face notoriously dangerous working conditions for low pay and are housing, when offered, is poor and often unsanitary. Conditions at the Sakuma Brothers Farm were no different and workers there had finally had enough. The first series of farmworker initiated boycotts, beginning in July 2013, yielded temporary increases in pay, payment of back wages, and some other concessions such as new bedding. But the early successes did not hold and farmworkers have yet to gain a fairly negotiated lasting contract with the farm. Because conditions have yet to improve despite these strikes, the farmworkers have expanded their call to action to include a boycott of berries produced on the farm, including those sold under the Driscoll’s brand name. This is an extreme measure that workers undertook only as a last resort. 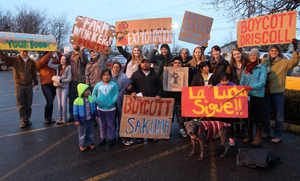 Despite Driscoll’s stated commitment to communities and sustainability, rather than insist Sakuma Brothers negotiate with their employees, workers on the farm report that Driscoll’s has actually increased purchases of these berries since the boycott began. Local stores in the Washington region have already stopped purchasing Sakuma Brothers berries under any name, but now organizers are calling for a national boycott of all Driscoll’s brand berries until Driscoll’s lives up to their commitment by suspending purchases of Sakuma Brothers berries until they negotiate a fair and binding contract with farmworkers. Fair World Project has joined the farmworkers’ call and organized a letter to Driscoll’s asking them to insist Sakuma Brothers negotiate a fair and legally binding contract with their farmworkers. This letter, in which consumers not only express solidarity with farmworkers, but also pledge to boycott Driscoll’s until this is resolved, was signed by nearly 10,000 consumers and mailed directly to Driscoll’s CEO. Consumers who missed the chance to sign the letter or who are looking to get more involved can still take action by writing a letter to the editor of your local newspaper calling attention to this situation. Also talk to the produce manager at your local store and let them know your concerns. Read the letter we sent to Driscoll’s and our press release covering this. Read more about the situation in an article in the latest edition of For a Better World. Get updates on the campaign at Familias Unidas por la Justicia’s Facebook page. I will not purchase Driscoll products during the FUJ/Sakuma labor dispute, until and unless Driscoll respects the FUJ workers boycott of Sakuma Brothers products.